Industrial REIT makes its eighth quarterly dividend payment. Industrial real estate investment trust STAG Industrial (NYSE:STAG) yesterday announced its second-quarter dividend, the eighth consecutive quarterly payout it's made. The board of directors said the quarterly payout of $0.30 per share is payable on July 15 to the holders of record at the close of business on June 28. That's the same amount declared in February when it raised the payout from $0.27 per share. Additionally, STAG declared a second-quarter dividend for its 9% Series A cumulative redeemable preferred stock of $0.5625 per share, which equates to $2.25 per share on an annualized basis, and its 6.625% Series B cumulative redeemable preferred stock of $0.34505 per share -- prorated for the period April 16 to June 30 -- which equates to $1.66 per share on an annualized basis. The Series A preferred stock trades on the NYSE under the symbol STAG Pr A. The Series B preferred stock also trades on the NYSE under STAG Pr B. The regular dividend payment equates to a $1.20-per-share annual dividend yielding 5.4% based on the closing price of STAG Industrial's stock on May 6. 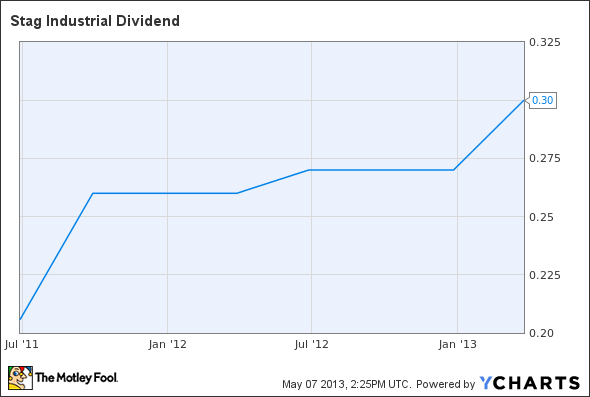 STAG Dividend data by YCharts.